Foster Broussard is a British criminal in 1850 who manages to convince Queen Victoria to stay his execution so he can head over to California and bring back loads of gold for England. (Legends of the Gold Rush were quite prolific back then.) Broussard is escorted by a Commander Vanderbuilt Frederick, but when they arrive in San Francisco, the crew is attacked and Broussard is taken captive. It turns out, though, that the attackers are old friends of Broussard and the entire escapade has been a year and half in planning. 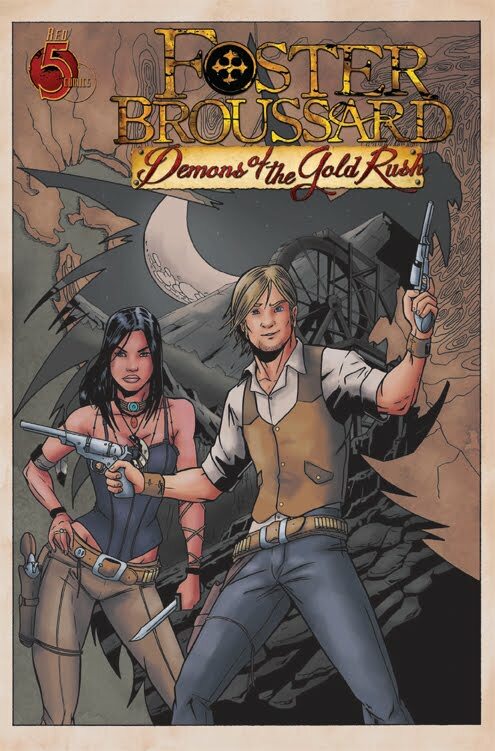 Broussard soon runs afoul of Damien Victor, owner of the largest claim in the territory, and Raya, a Native American who has been working for several months to get close to Victor. Plans go awry, drinks are thrown in people's faces, and the issue ends with Broussard having a gun pointed at his head. 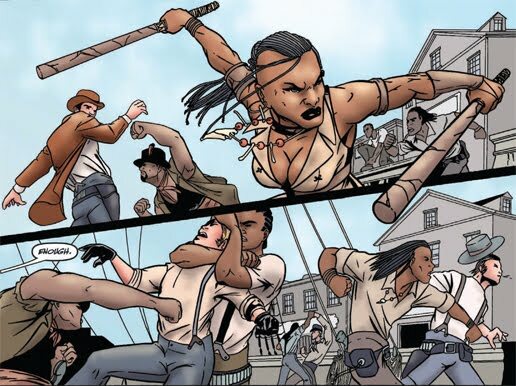 Bonnie Lass picks up where the last issue left off with Monet and his followers holding Lass and her crew captive aboard their own ship. The crew spend much of the issue trying to escape, only to be repeatedly have their butts handed to them by Monet himself. Bonnie engages with Monet long enough for her companions to get the upper hand against the other captors, but then they foolishly knock out the one element keeping the large kraken-like creature at bay. Bonnie's able to use the ill-advised diversion to capture Monet, but is now facing down a bona fide sea monster. I've noted in some of my earlier reviews that Red 5 was turning out lots of great comics, and I was constantly impressed with their work. 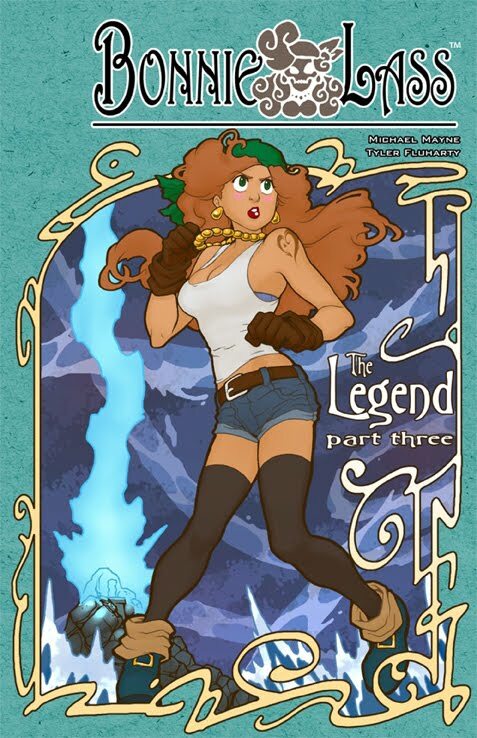 Bonnie Lass has been doing extremely well as a series, and #3 is no exception. But I have to say that I was rather disappointed with Broussard. Despite it being a book that I really wanted to like, it really struck me as incredibly pedestrian. Futhermore, the story in Broussard seems a bit more cliched and predictable. It reads like the storyboard for a movie in which the trailers tell the story better than the actual movie itself. Even with the plot twists, it just seemed... not exactly trite, but definitely not very engaging. A lot of staged contrivances and some strange character actions that either weren't explained well or weren't well thought-out. Interestingly, less actually happens in Bonnie Lass #3. The characters spend the entire issue in one spot. They talk and fight a bit. Fair amount of exposition. But it's a much more vibrant story. You don't see most of it coming (though the sea monster causing problems was pretty well foreshadowed throughout the issue), you get an idea of what next issue will be like and it's by far much more forward-moving than Broussard. That's actually what's striking me about Bonnie Lass as a series, now that I'm thinking about: Mayne is able to do quite a lot of storytelling in a fairly compressed space. In fact, I looked up a little over half-way through the issue, only to discover than I wasn't about to hit the last page! "Translated from the Native American"?!? Wow. There's not even an ATTEMPT there, is there? I was okay leaving Raya's specific ancestry unmentioned, but they're not even going to try to fake it by throwing in a random tribe name here? 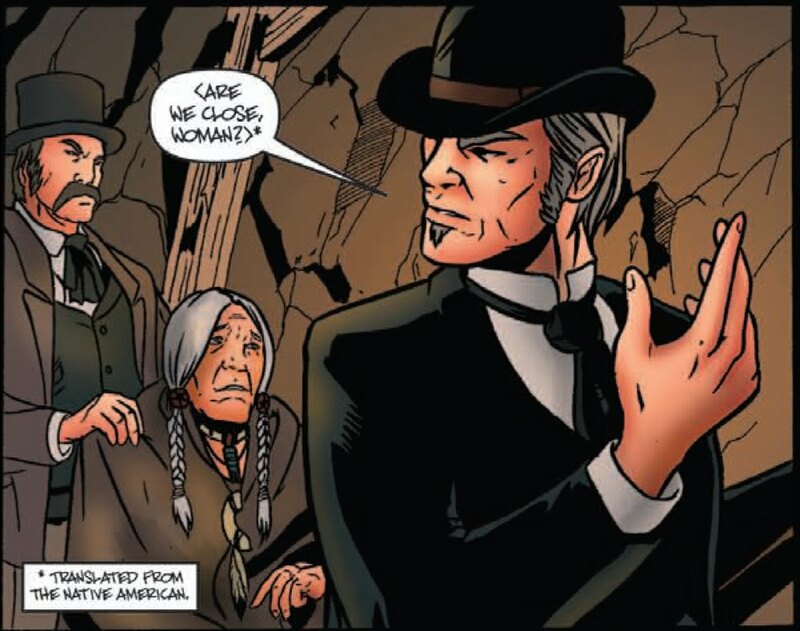 They could've said something like "Shawnee" and it probably would've at least slipped by most people that the Shawnee didn't live that far West. But "the Native American"? Really? Here in the 21st century, you're going to write that down and have it published? Wow. Even if I loved every other aspect of the issue, I'd be hard-pressed to look at the second issue based on that alone. Talk about insulting! Let me end on up beat. Go buy Bonnie Lass. If you haven't gotten the first two issues, you needn't worry -- they're ALL available digitally at comixology and iVerse for $1.99 each. I greatly enjoyed #1 and #2, and the third issue continues to impress. I'm looking forward to seeing how this story wraps up next issue, and when Red 5 will start releasing a Volume 2!